Hybrid Camera Revolution: New Sony FS5 - URSA Mini Killer? Today, 5 months after NAB 2015, Sony has launched a major counterattack against the URSA Mini (which finally started shipping yesterday). The new $6699 (body only) Sony PXW-FS5 is a lightweight Super 35, E mount camera with a 240 fps super slow motion burst capability, a built-in electronic ND filter and compatibility with affordable Sony power zooms (such as the $548 Sony 18-105mm constant f/4). The size, weight and image quality from this camera appear to be ideal for independent narrative and documentary filmmakers. Its compatibility with affordable power zoom lenses is an added bonus, and will probably cut into sales of the $4195 fixed lens Panasonic DVX200. 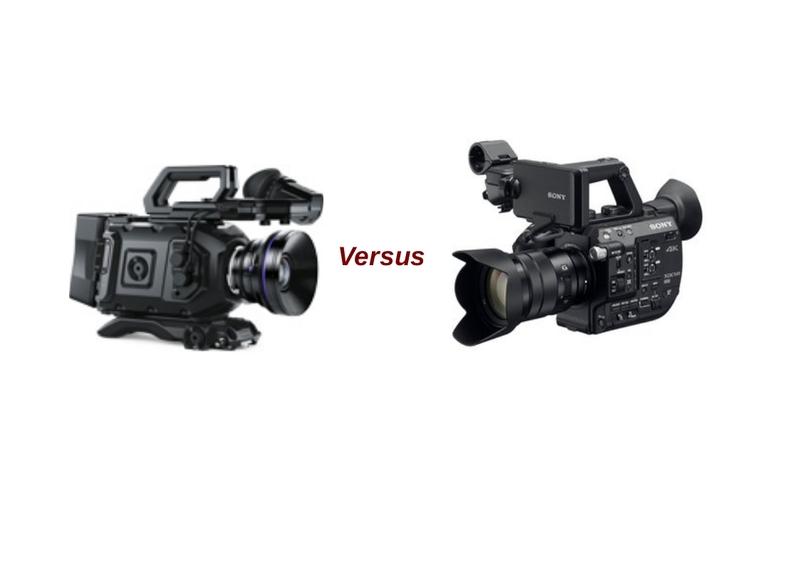 Here is a table comparing the specs between the FS5, both models of the URSA Mini and the Canon C300 Mark II (Canon's lowest priced 4K Super 35 camcorder). Weight 5 lbs. 5 lbs. 1.8 lbs. 7.4 lbs. Bottom line - this looks like a nice little camera - 240 fps, the ND filter, the OLED viewfinder and HD 4:2:2 are great features - and it produces nice looking UHD images on YouTube - but $6699 is a whole lot of money to pay for 100mbps 8-bit 4:2:0 UHD. The Blackmagic URSA Mini 4.6K EF (with the OEM viewfinder) is $209 less for a camera with higher resolution straight out of the box - plus built in 12-bit RAW recording (of course, that extra $209 might pay for one CFast 2.0 card). All of that said, both of these are great cameras - Sony and Blackmagic are to be commended for giving filmmakers such terrific tools at these prices. EDIT: Hat tip to reddit user /u/zdubs1, who points out that the pre-order price for the FS5 is actually $5599 , $1100(!) less than the $6699 list price. This makes the FS5 a whole lot more attractive, and a real threat to cameras such as the $5499 Canon C100 Mark II, which is limited to 1920x1080p maximum resolution and has no upgrade path the 4K or RAW.